iRig Micro Amp is a compact, battery-powered amp that lets you do more. At 15W RMS, it’s louder than you’d expect and covers a range of tones, with 3 custom-voiced analog channels: clean, drive, and lead. But iRig Micro Amp’s real magic comes from the included high-quality connection to your iPhone, iPad and Mac/PC. Jam through 10 amp and 26 stompbox models with the included AmpliTube CS app, plus 9 amp and 10 stomp models from AmpliTube 4 on Mac/PC. Plus, iRig Micro Amp’s connection lets you plug into all your favorite apps and software. Learn new songs, practice your favorite licks, perform with backing tracks, and even record your own songs easier than you ever imagined. All this in an ultra-compact size that’s easy to carry anywhere. With iRig Micro Amp you’ll never stop finding ways to take your playing further. iRig Micro Amp offers 15W power when plugged in, and 7.5W when running on 6 x AA batteries. Combined with a 4” custom-voiced speaker, it pumps out surprising volume at half the size of similarly-powered amps. So it’s perfect for everything from a bedroom or desktop, to jamming with friends or street busking. It offers 3 analog channels: clean, drive and lead, with the rich, warm sound you’d expect from the tone gurus behind AmpliTube. You get low, mid and high tone controls, plus adjustable gain, to easily dial in nearly any sound. Need more volume or a bigger speaker? iRig Micro Amp also offers a cabinet output, so it can keep up with a full drum kit for band practice. An aux input lets you connect any analog input, like an MP3 player, to jam along, and a headphone output is perfect for silent practice. With its compact size and flexible options, iRig Micro Amp is the perfect option for your gig bag, to be able to practice, jam or perform anytime, anywhere. 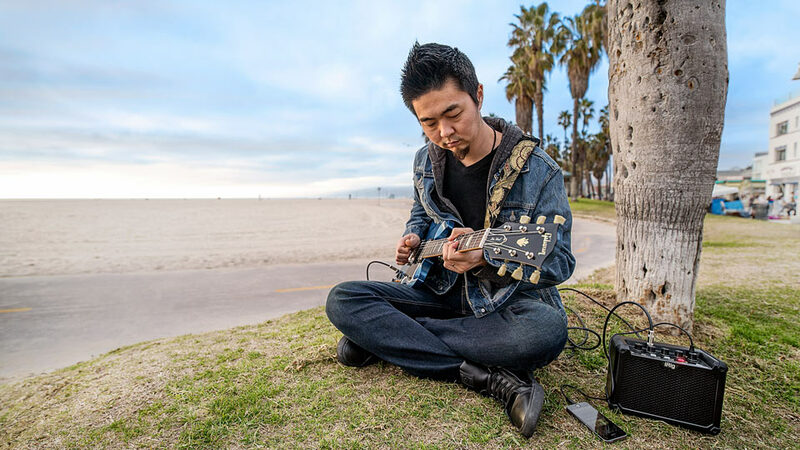 iRig Micro Amp also connects to your iPhone, iPad, Mac and PC, routing your guitar’s signal to your device to process or record, and plays back directly through the 4” speaker. It’s an entire setup in a single integrated unit derived from IK’s award-winning iRig HD 2 mobile guitar interface, with 24-bit, 96 kHz for pristine sound quality. With the included AmpliTube app and software, Micro Amp delivers the widest range of tones and a level of accuracy you’ve never heard in a practice amp before. 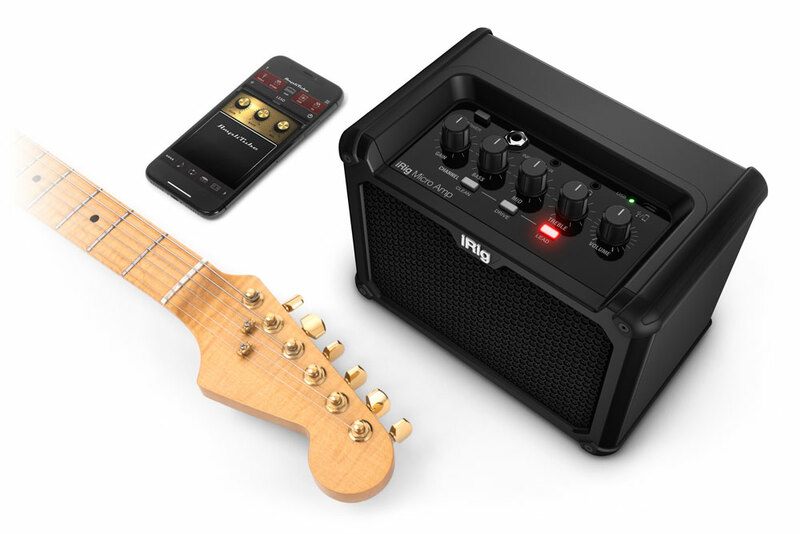 iRig Micro Amp unlocks 10 amps and 26 stompbox effects in AmpliTube CS for iPhone or iPad, and includes AmpliTube 4 for Mac/PC for 9 amps and 10 stomps. Right out of the box you can enjoy everything from vintage twang to screaming high-gain, and all the tone-shaping pedals you’d want. You can easily expand your sonic collection with IK’s range of additional amp and effect models – there are over 280 pieces to choose from, including officially licensed re-creations of gear from Fender®, Orange®, Mesa-Boogie® and other iconic gear manufacturers, as well as guitar legends like Slash, Jimi Hendrix and Dimebag Darrell, all available a la carte. 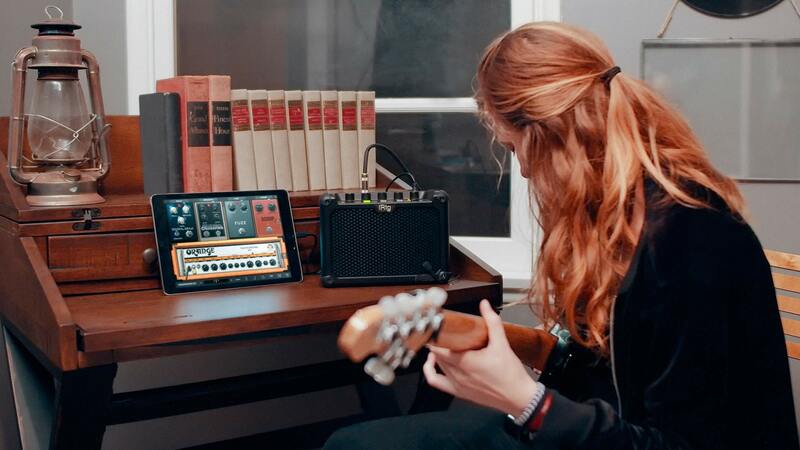 Beyond AmpliTube, iRig Micro Amp lets you connect to an endless array of apps and software. Learn new licks, polish your technique, or jam along with your favorite songs – iRig Micro Amp makes it easy and fun so you’ll never get bored. iRig Micro Amp also makes it easy to start recording your own music. 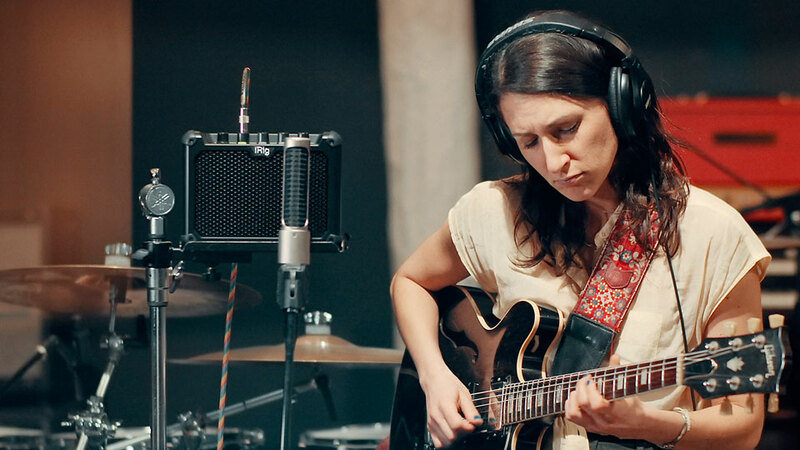 With apps like GarageBand, it’s a cinch to capture your ideas or even record a full track. But Micro Amp also works with professional recording software like Logic, Pro Tools and more, creating a convenient desktop setup for use on the go. There’s never been an amp that offers you this many ways to make music in a size you can carry anywhere. iRig Micro Amp really does let you take your playing further. iRig® Micro Amp and AmpliTube® are registered trademarks property of IK Multimedia Production Srl. All other product names and images, trademarks and artists names are the property of their respective owners, which are in no way associated or affiliated with IK Multimedia. Product names are used solely for the purpose of identifying the specific products that were studied during IK Multimedia’s sound model development and for describing certain types of tones produced with IK Multimedia’s digital modeling technology. Use of these names does not imply any cooperation or endorsement. iPhone®, iPod touch®, iPad®, GarageBand®, Mac® and the Mac logo are trademarks of Apple Computer, Inc., registered in the U.S. and other countries. App Store is a service mark of Apple Inc..